Lying 70 miles west of Key West, Florida is a group of islets, shoals and reefs which mark the entrance to the treacherous Florida Straits from the Gulf of Mexico. In 1513 after capturing 160 sea turtles Ponce de Leon named the island group ‘Las Tortugas’. Later the name was changed to the Dry Tortugas to denote the lack of potable water in the 80 square mile area. Although a light had been established on Garden Key in the Tortugas as early as 1826, mariners complained the light could not be seen beyond the shoals approaching the islands from the Gulf. 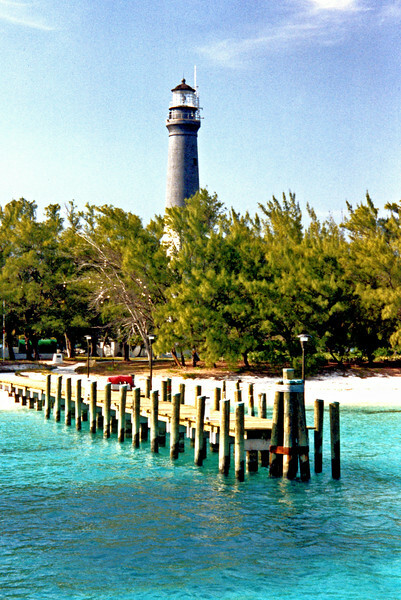 To address this, the Light House Board drew up plans to establish a first order light on Loggerhead Key in the 1850’s. On August 18, 1856 Congress appropriated $35,000 to build a First Order Light Station on Loggerhead Key in the Dry Tortugas. The key is only 1 mile long and 700 yards wide. The tower was supported by a grillage of cross-laid timbers as a foundation to prevent its sinking into the sand and would reach 150 feet in height. 203 granite steps were installed into the tower walls leading to the lantern.